Eric-Paul Riege, study 2 for Hólǫ́—it xistz , 2018, digital collage. Courtesy the artist. “Hólǫ́—it xistz” marks the first solo museum project for Eric-Paul Riege. Working across media, with an emphasis on woven sculpture, wearable art, and durational performance, Riege explores the worldview fostered by Diné, or Navajo, philosophy and its bearing on everyday experience. For “Hólǫ́—it xistz,” Riege has produced a group of weavings that use myth and storytelling to propose spaces of refuge. In the Diné language, hólǫ́ means “to exist.” For Riege, these weavings, which pay homage and link him to generations of women weavers in his family, exist as living things that aid him in generating sanctuary spaces. 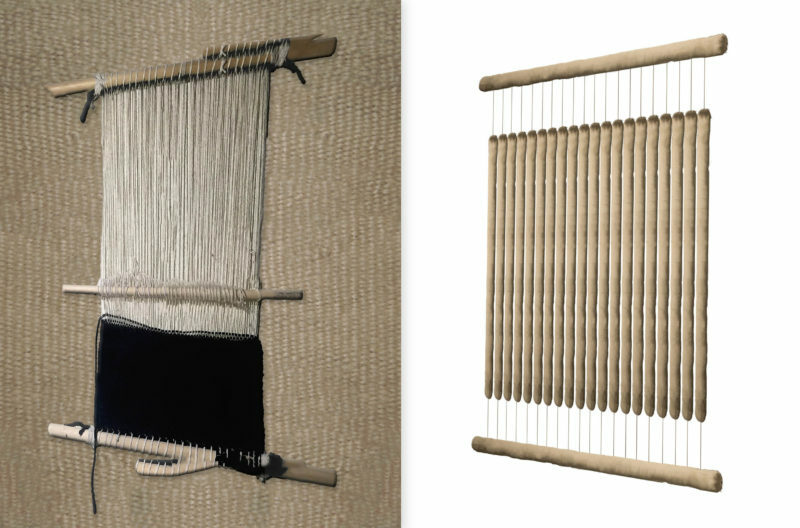 Hanging from looms, the weavings create an immersive and charged space influenced by ceremonial sites and dwellings, such as the traditional hogan made of logs and mud. Riege has also produced a piece of regalia that he will wear during durational performances scheduled throughout the run of the show. Eric-Paul Riege (Diné) (b. 1994, Na’nízhoozhí, Gallup, New Mexico) holds a BFA from the University of New Mexico. His work has been exhibited in the SITElines.2018 Biennial at Site Santa Fe. This exhibition is organized by ICA Miami and curated by Gean Moreno, Curator of Programs. This exhibition is presented in the Ray Ellen and Allan Yarkin Gallery, ICA Miami’s space dedicated to providing a platform for emerging and under-recognized artists from around the world early in their careers.